Yesterday we went to this year's Del Rey Day, a community event sponsored by the Del Rey Neighborhood Council. I appreciate the council's effort to build a sense of community with an event like this, but it doesn't seem to be working. Every year there appears to be less people attending the event. It always feels like the only people there are the ones who had something to do with planning the event itself. Del Rey suffers from a lack of identity. 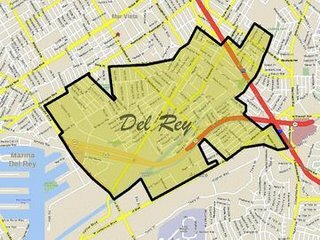 Few people in Del Rey would be able to tell you there is such a thing as Del Rey, let alone the fact that they live or work there. It really is an adjacent to community. It is the part that is left over after defining the boundaries of Marina Del Rey, Mar Vista, Culver City, and Playa Vista. There is no part of Del Rey that feels like the center of the community. Few, if any, real estate agents use the term Del Rey when advertising properties. If you tell someone you live in Del Rey, they will try to correct you and say "You mean Marina Del Rey? Playa Del Rey?". If you tell a cab driver at LAX to take you to Del Rey, they will give you a blank stare. This year they held the Del Rey Neighborhood Council officer elections at the Marina Del Rey Middle School to coincide with Del Rey Day. That was a good idea. They were able to muster up 137 voters according to the preliminary results. I think this was more voters than they've had in the past. Almost all the officer seats up for grabs had only one candidate to choose from which didn't make for a very exciting election. The only contested seat was for 2nd Vice President which was won by write-in candidate Katia D'Amico by a narrow margin. Katia told me that she ran at the last minute because she was concerned that there would otherwise be no Latino representation on the board for an area with quite a large Latino population. Have you heard about the search site Ms. Dewey? : http://www.missdewey.com/. An attractive woman, Ms. Dewey, vocally comments on your searches before showing you the search results. I don't think I'll be switching to this from Google anytime soon, but I did find it sort of addicting. I kept trying new keywords just to see what she would say. There seem to be a lot of custom responses to vulgar phrases like "Show me your #@?!" The whole thing is implemented in Flash, so it loads kind of slow. This weekend, the Theodore Payne Foundation for Wildflowers and Native Plants held its Fall Festival at its nursery in Sun Valley, CA. I heard about it from our Sierra Club newsletter. I went yesterday and attended a free workshop called Planting Natives. It was a great opportunity to ask questions and learn about plants native to Southern California. I am interested in replacing much of the lawn in our front and back yards with some kind of native plant landscape. Native plants have many benefits. For the most part, you don't have to water them or fertilize them. They attract native insects and animals. They are easy to grow since they have adapted to the climate over thousands of years. Until yesterday, it has been a struggle for me to figure out which plants in the local nurseries are really native. Plants from other Mediterranean areas like Australia and Africa are often grouped together with the California natives. The great thing about shopping at the Theodore Payne nursery is that every single plant and tree they sell is native to Southern California and they have an amazing selection and knowledgeable staff. While I was there, I bought the excellent book California Native Plants for the Garden . I highly recommend taking this book with you if you visit the Theodore Payne nursery. The plants on display are young and it is difficult to know what they will look like when they mature and flower. However, each plant is marked with its Latin name which can be used to quickly find a complete description and often a picture of the mature plant in the book. On the way home, I stopped at the Sepulveda Garden Center where the LA chapter of the California Native Plant Society was having another native plant sale. There I picked up another Firecracker Island Snapdragon, a Purple Sage (Salvia leucophylla), and a packet of California Poppy (Eschscholzia californica) seeds. When I got home, I planted all the new plants and seeds. I can't wait to see how they turn out. I went on my first full RIDE-Arc ride last night which was called Los Angeles Muertos. Starting at Wilshire and Western at 9:30 PM, we rode to various creepy parts of LA. Starting with an old crematory where some famous people were cremated (I can't remember who - they were famous long ago), we rode to the Angelus Rosedale cemetery which was built in the 1800s. There were a few famous people buried there, but the only one that meant anything to me was jazz pianist Art Tatum. We were given about 2o minutes to explore the cemetery grounds by bike. 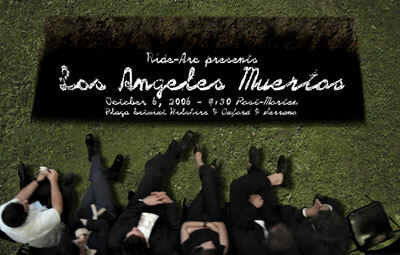 I was really hoping we'd go to the house featured in Six Feet Under since it is in the same West Adams neighborhood. Instead we went north and rode to the Hollywood Forever cemetery. Again, we were given about 30 minutes to explore. I had been to this cemetery many times at night, believe it or not, for Cinespia movie screenings. Still is was fun to explore the whole thing by bike. After that, we rode west on Hollywood Blvd, turned right up to the Magic Castle, stopped at a house where the Black Dahlia murder allegedly took place, and finally over to the Church of Scientology to end the ride. Jill was craving a doughnut so we stopped at Winchell's on the way home. We didn't get home until 2 AM. Earlier this week I found out that one of the Directors of Engineering at my company will be leaving for a new job at eHarmony. I was asked if I wanted to assume some of his responsibilities and manage a team of 4 people: 2 Java developers and 2 PL/SQL developers. At the risk of not getting to code very much anymore, I accepted and my title of Principal Engineer will be Engineering Manager starting October 16. I figured it was time for a new challenge and higher standing within my company. My new team will be focused on projects that typically last around 2-3 months. Just in the last few days, my job has changed tremendously. I am starting to get invited to a ton of meetings. Some are just to meet key business people, some are to learn about and prioritize all of the company's projects, and others are to get to know my new team and determine what our goals will be. During the last 2 days (16 hours) of work, I think it has been 14 hours of meetings and 2 hours of free time at my desk. I have a feeling that I'm going to have to start relying on side projects outside of work to keep up my programming chops. Right now I'm pouring through Ruby on Rails books and also working on a Java-based social shopping web site with a few other people. That should keep me pretty busy.